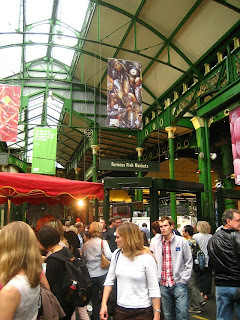 One of my favorite markets, and one of the best in the world, is the Borough Market in London. It's actually an unlikely tourist spot, and I probably wouldn't have known about it, if it wasn't for the advice I was given before we departed to London. This is the real London, and a visit to the Borough Market at the beginning of your visit can provide sacks of nourishment for the duration of your visit. Of course, after a cup of mulled wine, or a taste of Caerphilly cheese you may just start hunting down an estate agent to move closer to these amazing food experiences which you now realize you've been missing your entire life. I'll take one wilder-beast please! 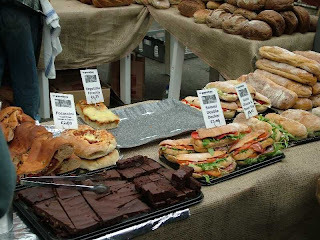 Unfortunately the Borough Market is only open on certain days so we had to wait till Thursday to go. It's centrally located, adjacent to the London Bridge Tube Station. Hidden by the facade of modern London, you might walk past it if there wasn't a chalk board sign propped upon the sidewalk. Walk through the emerald gates, and the market opens up to reveal a giant expanse like a time machine to another time. (It's bigger on the inside.) 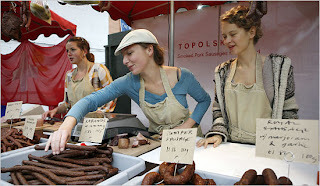 Every imaginable food from Italian to German, to French to Polish is available. Hogs' heads hang from the hooks, and you can bottle your own wine from a barrel yourself. One vendor serves a sort of "fried grilled cheese" sandwich, where they actually cook the cheese to a crisp on a griddle in French butter and then pile it onto two inch thick fresh bread. It's these sort of things that overwhelm your senses, and flood your mind with the most incredible, sweet emotions. Suddenly you feel like a member of some remote African tribe who has never seen the "white man" before. You feel like your world has become smaller just by the realization, even by food alone, there's so much before you that you've never experienced. Is this a dream or heaven? Either way don't wake me! Of course, one can only eat a certain amount of Polish sausage (stuffed by a actual Polish person), mint truffles, and chocolate bananas; as you lose yourself in the Borough Market, and before you're recognized for your American food envy. It's a dead give-away, the complete look of shock and surprise, as you move from vendor to vendor, item to item, from cheese wheel to fresh bread. 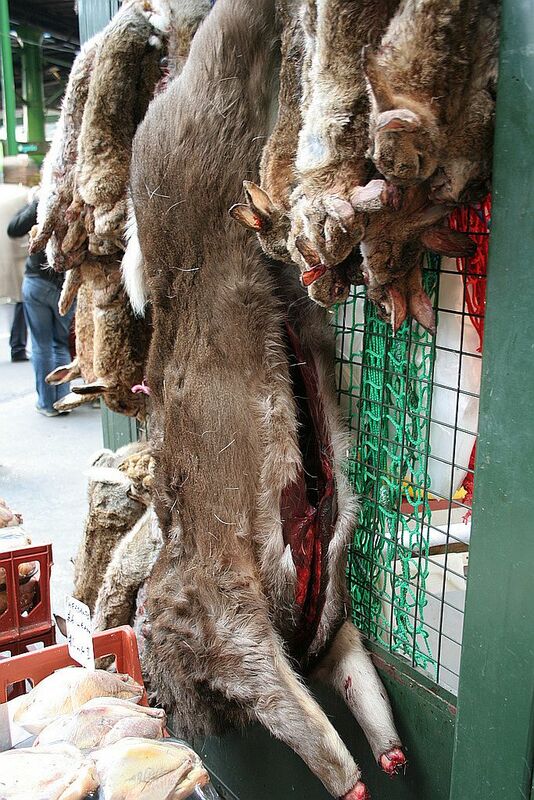 It was at the Borough Market the experience suddenly turned weird. While buying wine from what appeared to be a young English woman, she suddenly stammered and replied back to me in an American accent. At first, my brain a bit confused carried on with the transaction, but the questions within the depths of my mind were now causing my head to do that slight tilt as we all do in times of confusion. Was she American, pretending to be English? Is she an illegal immigrant? I wasn't prejudiced against the idea like many Americans are of Mexican immigration. To the contrary, I wanted to know why, how, and where can I sign up? I mean even Bono hasn't found what he's looking for? Maybe it's more human to be that illegal immigrant. To seek and find, to go boldly into the night where no one has gone before? Perhaps that is what it feels like to be alive, and everyone else including myself (if I don't act) is dead? For most of mankind's existence we've been nomadic, and now we're all happy to sit in our boxes of glass and wood and stare out at the world as we eat ourselves to death in front of giant televisions. In fact, I will go as far to say that this wine girl embraced her true human desires, to become migratory, to fullfill her nomadic callings, a beckoning ingrained in the DNA of each of us. She gave into this desire, how romantic is that I thought? As we began to walk away, lost in the maze of my mind, I could overhear her telling the gentlemen, likely her employer, she was off to lunch. I grabbed Shannon, whom I wasn't quite sure had caught on to any of this and dragged her along following my new interest like a 007 spy. The covert mission made it's way to the other end of the Borough Market, where our surveillance found the target exiting through a grim side-alley. There, a bustling little restaurant called "Fish!" queued hungry locals. As the woman ordered her fresh boneless haddock and chips (French fries), I carefully paid attention and duplicated her actions. I wanted to ask her "what's it like? where do I start? ", but became distracted as the chipper (the name given to people who work at a Fish and Chip shop) hand dipped my filet in their own "world famous" batter. Alas, in the commotion of paying, and smothering malt vinegar on my clearly more important desire: hunger, I had capitulated on my attempts to understand how to reinvent myself as a British Borough Market wine maiden. Mission: failed. Of course at that moment I was still under some belief, some silly American sentiment, that moving to the U.K. and living the life of someone else was a crazy, perhaps even irresponsible. Even as I stood there trying to talk myself out of what I was feeling, I was beginning to realize that what I wanted was what she had. What's worse, is merely by this random encounter I now knew it was possible. I could do it. I just had to make the choice. Like the food I had eaten, I was given insight and perspective, I had tasted what's possible, what could be, if I just start asking the right questions.